Finally! Since ELEAGUE entered the world of fighting games last year with Street Fighter V and Injustice 2, Tekken fans have been hopeful that one day, ELEAGUE would do the same for TEKKEN 7. That day has come! 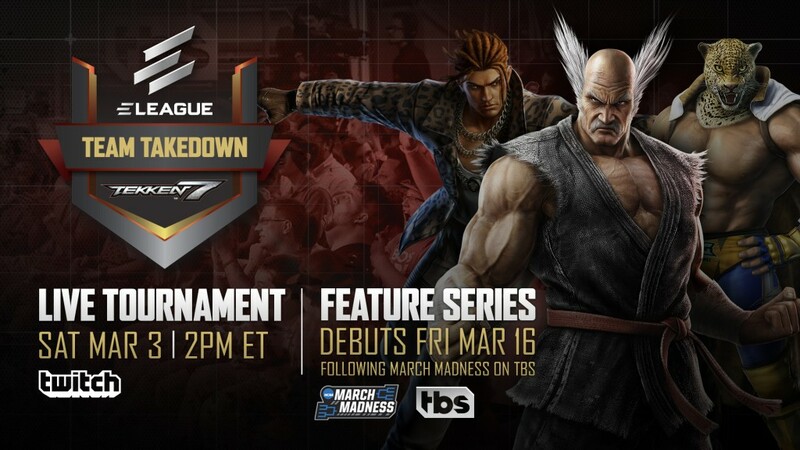 The ELEAGUE Tekken Team Takedown will take place March 3rd, live on TWITCH (probably twitch.tv/eleaguetv). The 4-part feature series will air on TBS from March 16th on, so set your DVR’s as the TBS show is where you will get the full package. This will be a team format, featuring 20 top players from the U.S. split into 4 teams battling it out in a single elimination bracket. Tekken 7 FR – Akuma has EX Meter and New Designs for Old Characters! Hot off the presses, Akuma has EX Meter in Tekken 7! Seems like he’s the only one who has it as well. Additionally, there are screenshots of the new designs for Alisa, Devil Jin, Hwoarang, Steve Fox, and Paul Phoenix. What happened to Hwoarang’s eye?! Check them out after the jump, or watch the video to see my thoughts of all of this! King of Iron Fist 2015 West Coast Qualifier – Archive! The King of Iron Fist 2015 West Coast Qualifier is live now (UPDATE: Archive below) from Round 1 at the Puente Hills Mall. The winner of this tournament will be one of the USA representatives sent to Japan to compete in the King of Iron Fist 2015 tournament later this year. The favorite to win is Mr.Naps, but there are quite a few contenders as Aris, MYK, Kane, Suiken, JustFrameJames and many others will be there as well. The stream is available from teamsp00ky. Check out the full twitch archive after the jump or if you prefer youtube, click here for the playlist of the Top 8.